There are a few variables when it comes to turtle habitats and setting up a glass aquarium due to the sheer amount of turtle species. But regardless if you have a mud turtle, painted turtle, red-ear slider or a Florida Cooter, there are a few constants for ensuring the wealth and health of your aquatic turtle, the most important being the correct food, clean water, adequate water temperatures and sufficient lighting. There are many ways of housing your aquatic turtle. You can keep them in a smaller swimming pool, a wooden home, specially designed reptile cages or the most popular; a glass turtle terrarium. The foremost property of any aquatic turtle tank setup should be its ability to hold water. Wooden tanks could begin to rot and glass tanks built for terrestrial reptiles could break when filled with water. Therefore, we strongly suggest investing in a specially designed water tank, a fish tank for example. 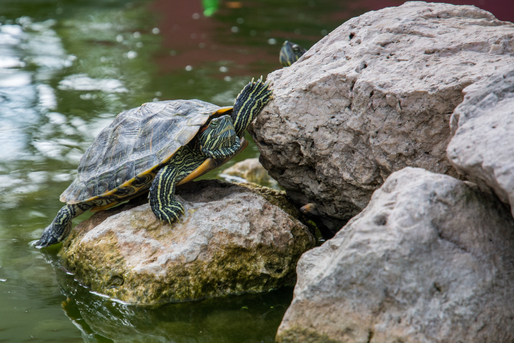 Your aquatic turtle should have more than enough leeway to fully submerge itself in the water, ample space to freely swim and have room to flip itself over without becoming stuck. The water should be deeper than the width of the turtles shell at an absolute minimum. The average life span of an aquatic turtle is 30 years, during which time they experience considerable growth, so if you buy a bigger tank now, you won’t have to keep purchasing new turtle tanks and equipment in line with the growth of your pet turtle. If you have an aquatic turtle, your first thought is water. However, it is highly important that you include an area of land within the turtle’s aquarium. A turtle basking area, although necessary, shouldn’t take up more than a quarter of your aquarium. It should be easy for your turtle to mount, but high enough it remains dry. If you have more than one turtle, the bank should be altered accoringly to ensure all of your turtles can fit on the basking area at any one time. There are many ways to build a familiar turtle basking area, this could be with soil, sand, aquarium gravel, driftwood or a collection of rocks. Ready-made docks are popular amongst turtle owners because of their convenience and easy maintenance. The floating banks adjust naturally to altering water levels and the floating feature means no precious swimming space is consumed. A key staple of your turtle aquarium setup is lighting and UV heat to mimic the natural sunshine. UV rays are absolutely vital for the health of your aquatic, this shouldn’t be seen as an unnecessary treat that you can get away without having. UV rays will give your aquatic turtle the vitamin D3 that is needs and will stimulate the appetite breeding and activity levels of your pet. It is highly recommended your turtle tank basking lamps are installed with a timer to run in-line with the natural sunshine pattern. This reinstates the importance of having a basking area in your turtle aquarium, as this area will give your aquatic turtle a comfortable area where they can relax in the “sunshine”. Think of it as a sun lounger for turtles! The correct humidity levels are also another important element of any turtle tank. If the air is too dry, thus drying out your turtles, they can experience a number of health issues such as skin conditions, swollen eyes and abscesses. Aquatic turtles will need a higher humidity level than terrestrial turtles but again this differs from breed to breed so you should always confirm the appropriate humidity levels with a vet. The humidity of your turtle habitat can be measured with a hygrometer. Similarly, the temperature in your turtle house should be closely monitored at all times to avoid over or under-heating of your pet turtle. You will need a thermometer that is able gauge both air and water temperatures. The air in the turtle basking area must be approximately 27°C, which can be achieved with your basking lights and heat lamps. Water temperatures should hover around 26°C which can be attained with submersible water heaters. Without the appropriate use of turtle tank filters, your water would become very dirty, very quickly, and will result in you needing to change the water almost daily, as turtles produce a lot of waste. Turtle aquarium filters just ensure your turtle’s habitat remains a sanitary, clean and most importantly, safe environment for them to live in. The bigger your filter the less it will need clearing, although some people will double up and use two to reduce the levels of maintenance. 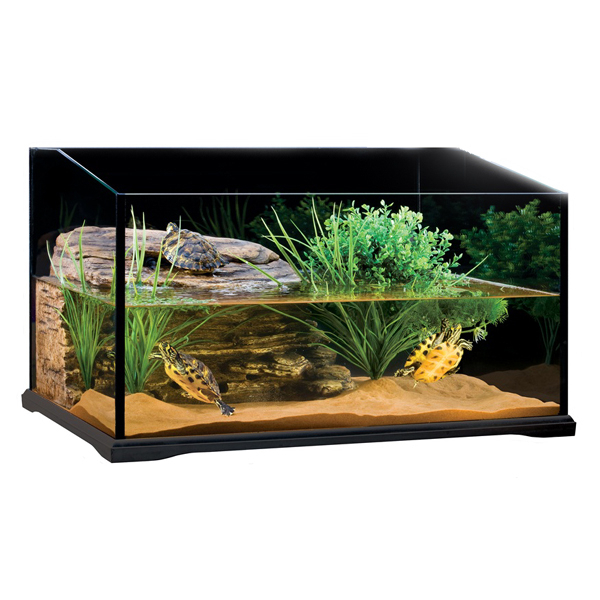 Although many people will use landscaping items and turtle tank accessories to make the aquarium aesthetically pleasing, they are actually more significant than this and can help make your turtle feel safer and more at home in their aquatic turtle tank, and will make the environment seem more natural and real to life. Substrates are used at the bottom of almost all turtle terrariums. This comes in a number of forms, with some of the most popular being crushed coral, aquarium gravel, fine sand and fluorite. If you are a new aquatic turtle owner, following these simple steps will lead you to setting up a safe and happy turtle house for your pet. CD Aquatics have all of the turtle tank accessories and terrarium equipment you might need, but more than this, we are on hand to offer advice where it is needed. If you need assistance with choosing the best tank supplied for your turtle aquarium, you can contact us today on 01922 416284 and we will help you pick out some FIN-tastic products.